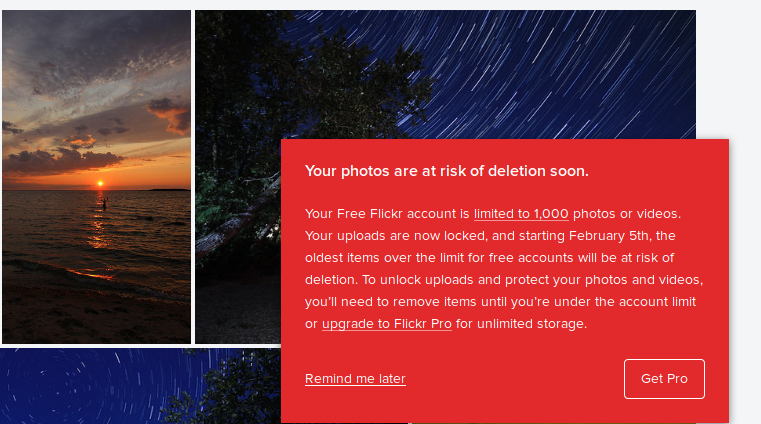 I’ve been a Flickr mem­ber since almost its incep­tion. I signed up some­time in 2004. I’ve been there through it all, and most­ly enjoyed my time. But when the new own­ers (ie, Smug­Mug) tell me they’re going to start delet­ing my pho­tos if I don’t pony up for a Pro account, well, that’s it. I’m out. PS: I’m in the process of mov­ing my pho­tos off Flickr and onto my own per­son­al site (ie, this one). So I’m not going to lose sleep over the whole “your pho­tos are get­ting delet­ed” thing. Let me know if you’re inter­est­ed in the sim­ple Word­Press plu­g­in I’ve built in order to pull my pho­tos. Posted in flickrblogging, So it goes. Tagged blinky.